• 1,076 sq. 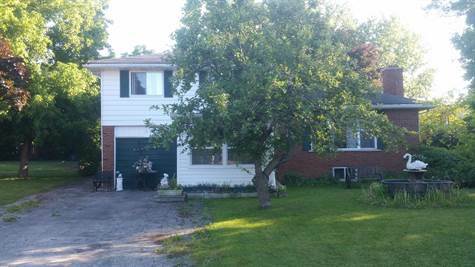 ft., 2 bath, 3 bdrm 3-level split - MLS® $269,000 CAD - Great offering! Collingwood Central, Collingwood - Welcome to 13 Whipps CRT. This 3 level side split home has so much to offer! The main floor features an "L" shaped Living and dining area, with fireplace, a functional kitchen, as well as an office /computer station area and a 2 piece powder room. Three large bedrooms and a large 4 piece bathroom can be found on the second floor. A large Rec room with gas fireplace and dedicated wet bar, and laundry/furnace room can be found on the lower level. The home is also complimented by a bright 4 season sun room. A single attached garage with inside entry will come in handy. A large patio area as well as deck opens onto a "Park-like setting" which will blow your mind. The beautiful shade trees and beautiful landscaping is guaranteed to leave you in a peaceful frame of mind! The two apple trees at the front are an added bonus for feeding the deer! Loads of storage inside the home and outside. All of this on a quiet Cul-de-sac, close to elementary and High schools and most amenities. If you are looking for a Family home, this should be on your list!